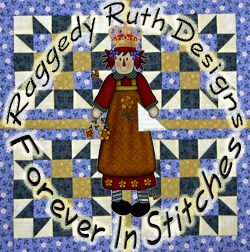 Welcome to Raggedy Ruth Designs' and Forever In Stitches' Retail & Digital Web-Store! Shipping with purchases over $20.00 is free! We feature the Perfect Corner Ruler(TM), over 160 quilting patterns, and 2 books from Raggedy Ruth Designs(TM), as well as over 1,600 downloadable digitized automated quilting machine designs from Forever In Stitches, LLC. Please feel free to peruse or purchase the products. Wholesale and Distributor and international orders MUST be placed by telephone at +1.419.358.0656 or email isales@foreverinstitches.com. Sales using this page are only for retail orders shipped to locations in the 50 states of the USA. All pictures, descriptions, and other information should be of interest to all quilters, shop owners, and distributors. All purchase from this site must be paid for by credit card, debit card, or PayPal. Please note that all on-site payments using credit cards, debit cards, and PayPal are processed by PayPal. You do not need a PayPal account for credit and debit card payments!. Please feel free to contact us if you have questions about our products, or if you are looking for something specific. Call us today at +1.419.358.0656 or email us at sales@ForeverInStitches.com. © 2005-2019 All content by Forever In Stitches, LLC. All rights reserved.